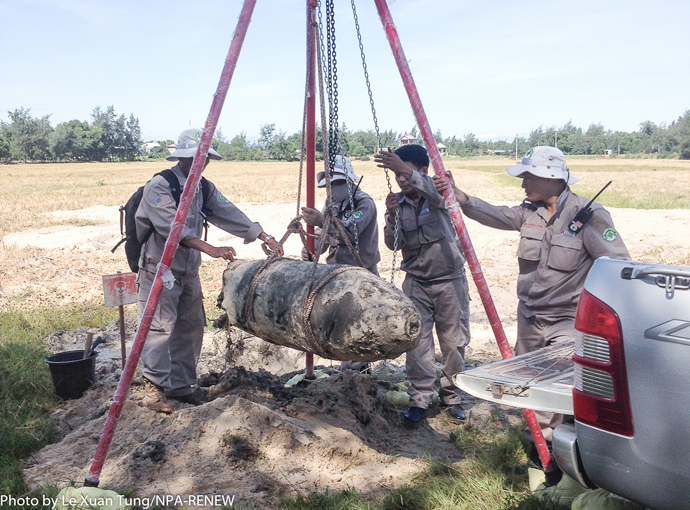 Trieu Phong, Quang Tri (26 June 2017) — RENEW-NPA teams today safely destroyed a U.S. 750-pound bomb found in a rice paddy in Ha Tay Village of Trieu An Commune, about one km from Cua Viet port, formerly a logistics and support base for U.S. Marine units along the DMZ. 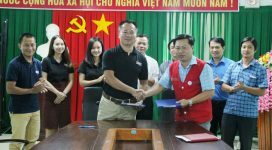 The demolition task was triggered by a request from the Province Military Command for RENEW-NPA to respond to discovery of the bomb which was reported by Trieu An Commune authorities on Sunday. A group of men searching for scrap metal found the bomb buried deeply in a field where rice had just been harvested. Local residents who saw the activity realized the men were strangers, from outside the area. 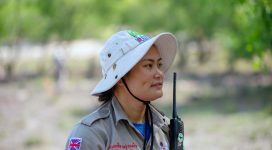 Remembering the risk education lessons that all Quang Tri residents receive, the neighbors promptly notified the village chief who immediately intervened and stopped the scrap metal collectors from any further activity. He then alerted commune authorities. Trieu An Commune assigned a paramilitary team to guard the bomb until RENEW-NPA teams could show up and take responsibility. On Monday morning, RENEW-NPA deployed EOD Team No. 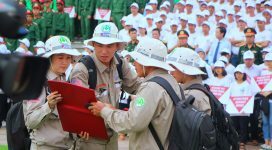 1 led by Team Leader Le Xuan Tung and National Technical Officer Bui Trong Hong, a retired PAVN colonel, to Ha Tay Village. The bomb was identified as one of the M177 series, a free-fall, unguided general purpose bomb which was dropped here by U.S. military aircraft during years of bombing missions. At least eight million tons of bombs were used by the U.S. military in Viet Nam, of which the Pentagon estimates about 10 percent did not detonate as designed. The M117 is being loaded onto the team’s truck for transportation to the central demolition site. After examining the bomb carefully, Col. Hong determined that the two fuzes on the bomb were both sufficiently damaged to render them harmless. Therefore he directed the team to transport the bomb to the central demolition site for disposal. A tripod pulley had to be used because of the burden of loading such a heavy bomb onto the truck. Five kilometers away at the RENEW-NPA central demolition site, members of Technical Survey Teams 16 and 17, and EOD Team No. 3, were building a special demolition pit. At 09:30, the M117 bomb was unloaded from the truck at the demolition site. Under Col. Hong’s guidance, all the team members worked together to secure the bomb in the demolition pit, with assistance from the tripod pulley. The bomb was successfully detonated around 11:30 a.m. This was the third U.S. aerial bomb to be safely destroyed by RENEW-NPA teams during the first half of 2016. Most of the bombs were deeply buried, and were uncovered by local people who were searching for scrap metal. The Project RENEW – Norwegian People’s Aid survey and clearance program is funded by the U.S. Department of State’s Office of Weapons Removal and Abatement.